James Benford has written a historical timeline for the development of laser pushed space sails. May 21, 2010: First deployment of a functional solar sail in space, “IKAROS” (Interplanetary Kite-craft Accelerated by Radiation Of the Sun) is demonstrated by the Japanese Space Agency JAXA. 2011: “100 Year Starship”, a joint project between NASA (Pete Worden) and DARPA (David Neyland), convenes a colloquium in Orlando to discuss interstellar travel, stimulating interest in practical starflight. 2012: Greg Matloff proposes graphene for sail material that can sustain high accelerations. 2013: James Benford creates a cost-optimization equation for beam-driven propulsion systems. April 2015: Philip Lubin introduces concept for small ultra-light ‘spacecraft on a wafer’ using multi-layer dielectric on metalized plastic film. In “A Roadmap to Interstellar Flight,” Lubin draws on Forward’s laser-sail work and extends it into much smaller sail designs. March 2016: Yuri Milner concludes the only credible way to achieve interstellar travel in the near-term is beam-driven sails, in consultation with Avi Loeb, Pete Worden and Pete Klupar. April 12, 2016: Yuri Milner, Stephen Hawking and Pete Worden announce the beginning of Breakthrough Starshot, a [$100 million] project to launch beam-driven sails to Alpha Centauri within 20 years. Freeman Dyson is present. 2016: Kevin Parkin creates an engineering inference engine for optimizing beamed sail systems, including cost minimization. April 15, 2016: Breakthrough: Discuss, a 2 day symposium, brings together the Breakthrough Starshot team, as well as that of Breakthrough: Listen, a SETI project begun it 2015. 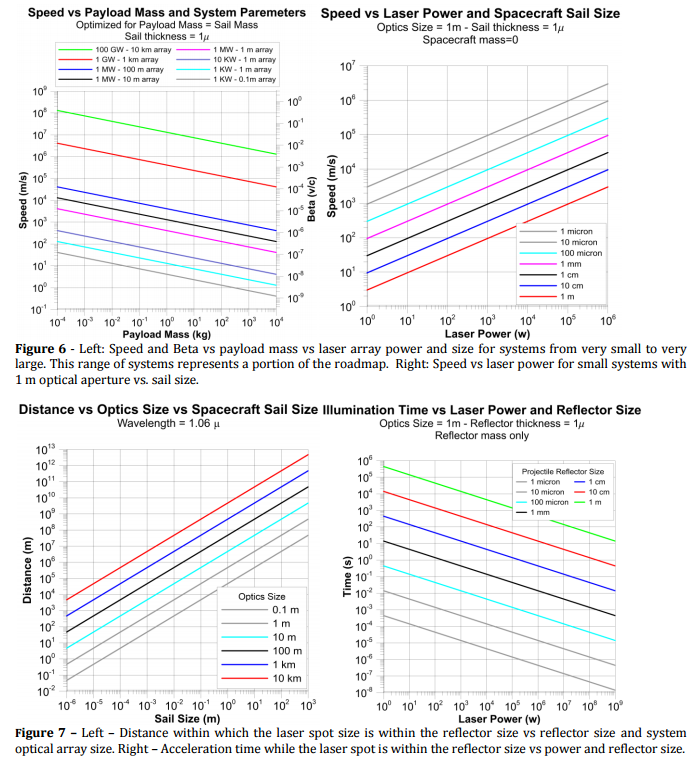 Here is a 68 page roadmap by Philip Lubin of the University of Santa Barbara for developing laser pushed sails. Lubin’s designs would enable wafersats to reach 25% of lightspeed and a 100 ton spaceship to reach 1000 kilometers per second. Nextbigfuture notes that for manned missions going beyond 1000 km per second, the wafer chips could be accelerated at a manned ship with a pusher plate (like the Project Orion ship) but the energy would be kinetic and not nuclear. For large object construction, we need to develop the Tether Unlimited Spiderfab technology. This is construction in space with robots which means systems can be lighter and bigger like robots assembling an outdoor tent of sticks in space instead of building something on the ground and making it tough enough to withstand 3Gs or more of acceleration at launch. They propose a roadmap to a program that will lead to sending relativistic probes to the nearest stars and will open up a vast array of possibilities of flight both within our solar system and far beyond. Spacecraft from gram level complete spacecraft on a wafer (“wafersats”) that reach more than ¼ c and reach the nearest star in 20 years to spacecraft with masses more than 100,000 kg (100 tons) that can reach speeds of greater than 1000 km/s. These systems can be propelled to speeds currently unimaginable with existing propulsion technologies. To do so requires a fundamental change in our thinking of both propulsion and in many cases what a spacecraft is. In addition to larger spacecraft, some capable of transporting humans, we consider functional spacecraft on a wafer, including integrated optical communications, imaging systems, photon thrusters, power and sensors combined with directed energy propulsion. 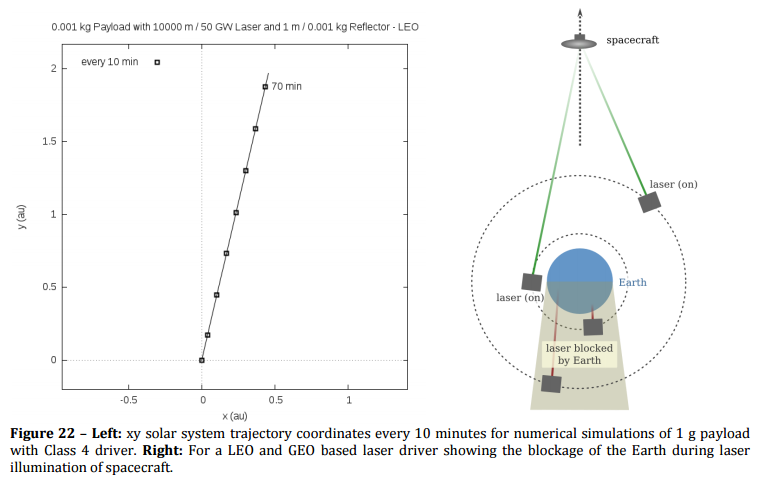 The costs can be amortized over a very large number of missions beyond relativistic spacecraft as such planetary defense, beamed energy for distant spacecraft, sending power back to Earth, stand-off composition analysis of solar system targets, long range laser communications, SETI searches and even terraforming. The human factor of exploring the nearest stars and exo-planets would be a profound voyage for humanity, one whose non-scientific implications would be enormous. It is time to begin this inevitable journey far beyond our home. 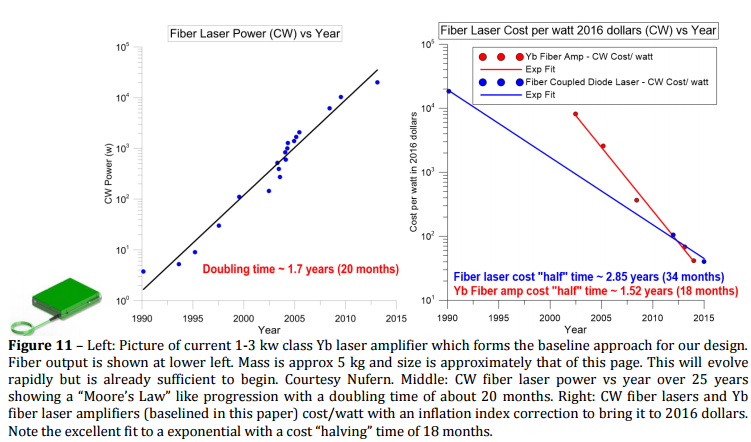 New fiber-fed lasers at 1 micron have efficiencies near 40% (DARPA Excalibur program). They assume incremental efficiency increases to 70% though current efficiencies are already good enough to start the program. It is conceivable that power density could increase to 10 kW/kg in a decade given the current pace. Current space multijunction PV has an efficiency of nearing 40% with deployable mass per power of less than 7 kg/kW (ATK Megaflex as baselined for DE-STARLITE). Multi junction devices with efficiency in excess of 50% are on the horizon with current laboratory work exploring PV at efficiencies up to 70% over the next decade. They anticipate over a 20 year period PV efficiency will rise significantly, though it is NOT necessary for the roadmap to proceed. Study techniques to keep beam on reflector using “beacons”. Develop roadmap to reducing radiator mass by 10x as goal.